What's more boho-chic than jazzed-up elephants, suns, & tribal print? In a soft lavender and white, this design will make all music-festival lovers, flower-crown enthusiasts, reminiscent hippies, and even just animal lovers swoon. 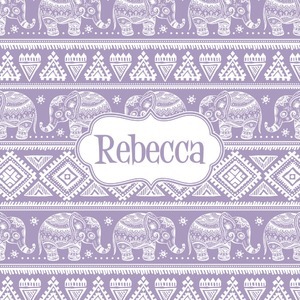 In the same sweet lavender, there is a label in the center, the perfect place for your name or customization. Peace out.